Christmas dinner was an 18lb turkey with all the fixings. That meant there were a lot of turkey bones left to make homemade stock. There were so many, in fact, that I froze half of them to use later when this batch of stock runs out. I have a six-quart slow cooker, which yielded three 900mL containers of stock (the same volume as one store bought carton of broth). This way, I can freeze them in portions required for a pot of soup. The containers I used are Ziplock 946mL with liquid safe lids (they twist on like a peanut butter lid). Once your broth is done, the soup recipe is below. Place turkey bones in bottom of slow cooker pot. Chop carrots, celery and leeks in 1 1/2 inch chunks and place in pot. Add onion and garlic (whole). Add bay leaves, parsley, thyme, rosemary and peppercorns. Fill pot with water to 1 inch below the rim (about 12 cups). Cover and set slow cooker to low for 12-18 hours. When cook time is complete, use tongs to remove large pieces of bone and vegetables. Ladle stock through a mesh sieve to strain and pour into containers. Allow to cool, then freeze. Thawed stock can remain in fridge for up to three days before use. 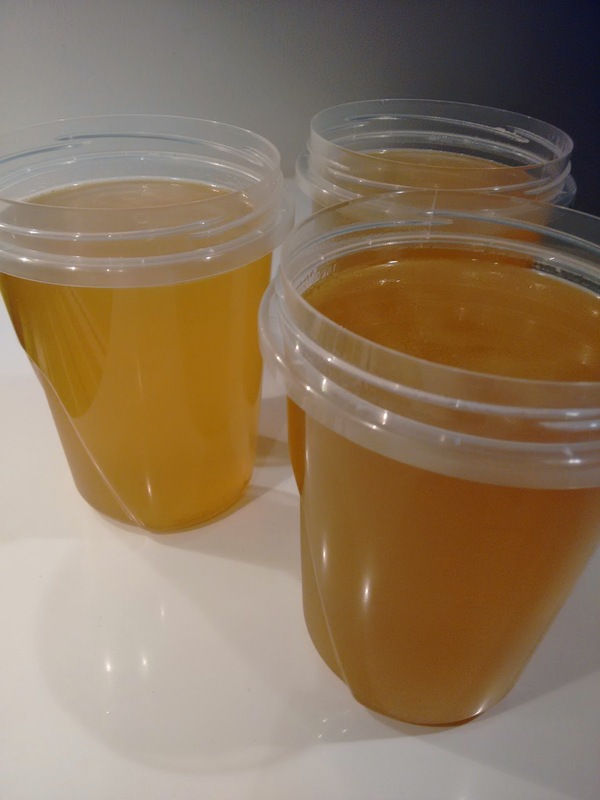 Homemade turkey broth is rich in flavour, inexpensive, and low in sodium. Layer all vegetables in slow cooker pot. Add turkey broth, bay leaves, dried herbs and spices. Cook on low for 6 hours. 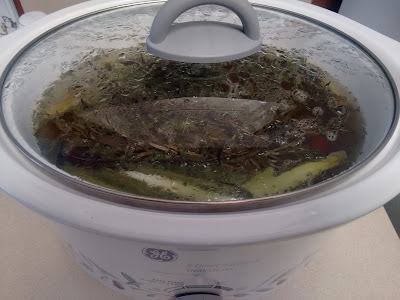 When there is 1 hour remaining on the cooking time, remove bay leaves, add cooked turkey pieces, and stir. Replace lid on slow cooker. Cook brown rice on stove top according to instructions. Remove the lid from the slow cooker, and add cooked rice. Stir and serve.